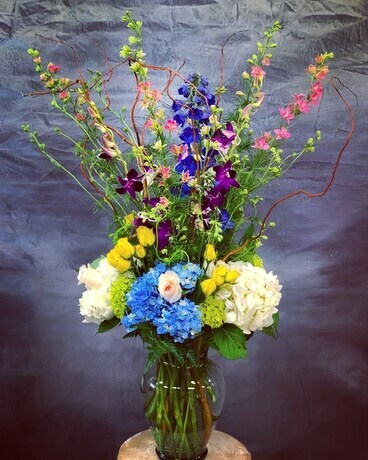 A spectacular combination of hydrangeas, roses, larkspurs, delphinium and curly willows. Standing at 3 feet tall, this modern and colorful creation is made to impress. As always, we reserve the right to substitute for similar plants at equal value or more to ensure your order is delivered in a timely manner. If you are keen on the types/colors of flowers in this arrangement and prefer no substitution, please give us a call to inquire before placing your order. Deluxe version will include more roses.